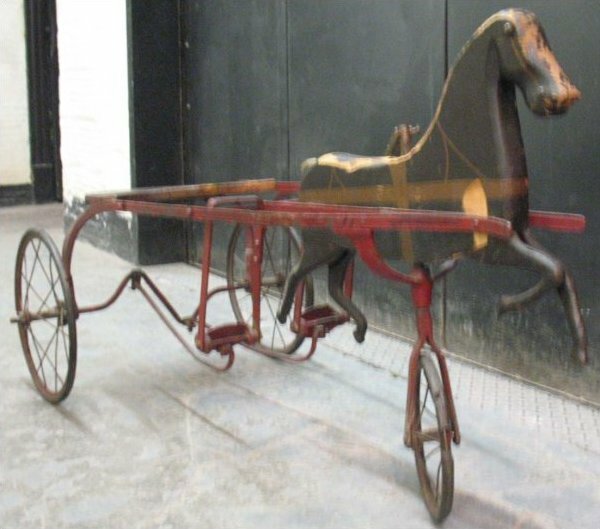 This horse drawn sulky (a carriage form used in harness racing) is set in motion when the rider pedals placing the feet into the elongated stirrup forms; this drives the wheels. Originally intended as a child's toy, collectors appreciate the folk art profile of this sculptural form and display it rather than ride it. Possible manufacturer is Bauer & Krause.The horse no longer has a tail or mane, and has small areas where some wood chipped off. Old black repaint to horse, ironwork is original red paint.